When I first installed it, I noted clouds of white smoke coming from it. Oddly it smelt more like burning hydraulic oil rather than electrical. But it worked, so why worry... right? Well, last week it caught up with me when it failed with the loader arms down after loading a log. I pulled the pump and tore it apart and the motor was smoked. The armature and windings were fried. So, I dropped it off at a buddy's who rebuilds electric motors all the time. Woodmizer was closed because of the holidays. I knew it would be at least a week for parts to get a new motor so I called Woodmizer when they opened up for the New Year. Amazingly they had an entire pump and motor assembly in stock, and it was only $320 or so. I drove over and picked it up, installed it and was back in business. So now, I'm going to have a spare motor/ pump in a couple days. When I installed the new motor, it dawns on me that the housing is designed for 2 motor/pump units, and a pair of solenoids. If I install the rebuilt assembly, I can plumb them together and get double the flow, like a super. Has anyone made this mod? I'm pretty sure that the electrics are simple enough, just add another solenoid to control the 2nd motor. I'm not sure how they tie both pumps together on say the super series. Do they simply T the outputs, or do I need check valves to prevent backflow into the 2nd pump if one fails?. How do they handle the return to both pumps so one tank doesn't overflow? If anyone knows the solution I'd be grateful. The other issue that I want to solve is the hydraulics anywhere mod that other Woodmizer owners have done. I know how to accomplish it by adding power track and a long cable, but I'm pretty sure others have done it by adding a separate battery up near the head of the machine. It could be charged when the head returns where it's over the power strip. I much prefer this simpler method. Any idea how the complete install for this is done? After adding my powered toe rollers (that are working great... what a nice mod) I've got 7 sets of toes rollers on my extension. I'm getting tired of walking all the way to the head of the mill when I'm working with beams way down on the end of the extension and need to raise and lower the rollers at that end. I've ordered in a bunch of 12 VDC solenoid valves that I'm wiring in parallel so I can run the rollers with an electrical toggle switch. It should still start and stop the pump as usual when the switch is moved to raise or lower the toggles. Best of all I'll have a set of switches at both ends of the mill so I don't have to wak back and forth. I'll let you know how it works out. One more question. It appears that the stock Woodmizer valves are closed center. Is there some type of relief built into the pump or valve bank to allow the fluid a place to go if the pump, runs but no spool is active? I didn't think they were closed center. When my micro switch quit, I put in a toggle switch to turn the pumps on. They weren't deadheading when I wasn't using any of the valves. If they were, the gauge would have shown the backpressure. I can't effectively use more than one at a time so yes I would say they are open center. I did the hydraulics anywhere mod maybe 10 years ago.I bought some really uptown welding cable and ran a power and a ground cable as well instead of that bottom rail wiper connection. I dont know if its just wishful thinking on my part but my unscientific memory archives tells me that I dont go through as many brushes or solenoids as I did before the modification. Regardless, I couldnt imagine running my mill without this mod.. I have the hydraulics anywhere mod, a battery under the hydraulic box. 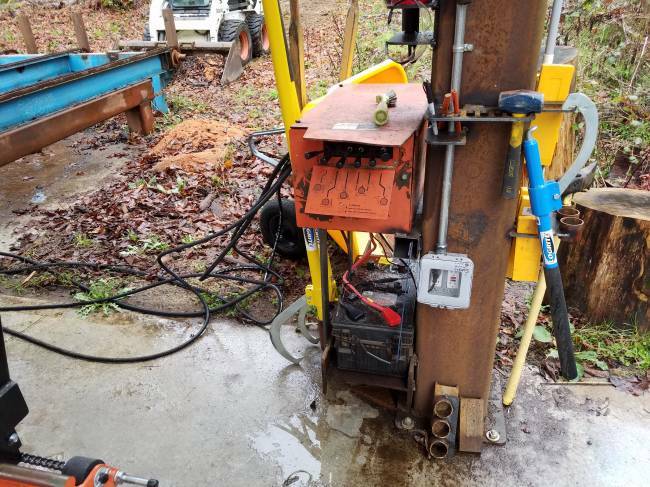 So when you add an extra battery, do you just connect the power and ground the the same connections on the hydraulic pump? Does it charge enough when the head is parked, and if the batteries are at different levels does it cause any issues? I've got access to a bunch of 8D batteries that are in good shape that should work well. That's what I'm using on the hydraulic pack to run my accessories. I keep it charged with a battery maintainer that's always plugged in. It seems to work O/K. I only used the battery to unclamp so I could drag the last board back. I didn't want to run the battery down, then have a big arc when the head came back on the contract strip. The tanks are just tied together. If you add fluid to one the fluid will equalize between the two tanks. As for the hydraulics everywhere I think you will have to have a separate battery with a charger on it since you don't have a cat track to run the cable through. And yes each hydraulic pump has it's own solenoid. And there's no check valves, if one pump stops pumping, the other will cause oil to overflow. Thats why I put these 12V clearance lights on the output of the solenoids. If one is out, that solenoid is not working. Also the lights show if the pumps remain on when lever is released, or if they dim that shows something is up with voltage. I really like those lights, but what is that white sawdust on the ground?? Thems grits overflowed from our production vat. OK, we only use/cook/eat yellow Grits so it caught me off guard. I'll try to be more observant in the future. Everyone with dual pumps should always have a plug handy. Remove the vent from the failed pump and replace it with the plug. Now you can finish the day/job using the operating pump.